Going out and need to looks your best? No problem. Nu Skin Face Lift™ Powder and Activator goes to work immediately to temporarily lift, firm, and tone skin and reduce the appearance of lines and wrinkles on your face and neck. 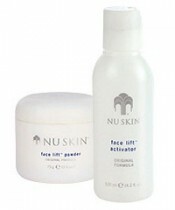 Nu Skin Face Lift is a two-part system consisting of Face Lift Activator and Face Lift Powder. Contains albumin, an egg white-derived ingredient, and elastin, a structural protein found naturally in the skin. Original Formula has a slightly tighter pull on the face than the Sensitive Formula for temporary reduction of visible lines and wrinkles. Revives dull, tired skin by improving the appearance of the skin’s tone and texture, for a smoother, tighter, all-around healthier feel. Delivers much-needed conditioning to the skin with a combination of wholesome ingredients. Soothes and softens with the use of natural aloe vera. Creates a younger look by temporarily diminishing the appearance of lines and wrinkles. Albumen is a substance derived from egg whites that helps to tighten and firm skin. Aloe leaf juice, allantoin and panthenol work together to soothe and nurture skin. Cleanse face and neck with Cleansing Lotion or other cleansing choice. Mix one teaspoon of Lift Activator with one teaspoon of Lift Powder until you have the consistency of a thin lotion. Before first usage, first test lotion for irritancy on a small, unnoticeable two-inch area of the skin such as behind the ear. Apply in an upward-outward motion with a brush in an even light coat. Leave on for 30 minutes. Remove by thoroughly flushing with warm water. Follow with pH Balance, Celltrex Ultra Recovery Fluid and the Nu Skin moisturizer of your choice. Use once or twice weekly. Nu Skin Face Lift Powder and Activator are perfect for both men and women who want to instantly lift and tighten their face and neck for more youthful appearance. 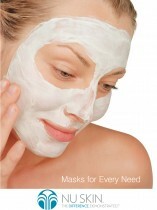 Just use it several times a week and everyone will notice a more smoother, tighter and youthful look of your skin.